I recently installed Linux Mint 19 MATE in VirtualBox. I already installed the guest additions. 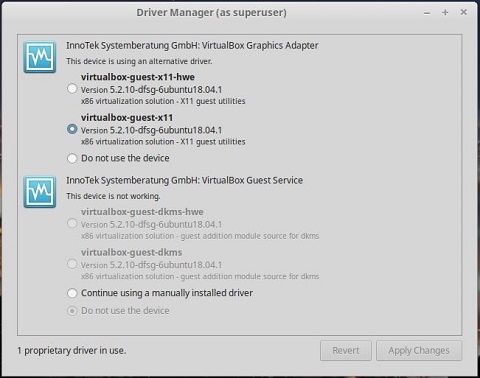 Afterwards, i ran the driver manager and, given the options, selected to install "virtualbox-guest-x11"
Is this ok or should i change something? Last edited by AlexCa on Thu Aug 30, 2018 2:50 pm, edited 1 time in total. What version of Vbox are you using and what host OS are you running on? You don't normally need to activate any of the versions of guest additions presented in Driver Manager if you've installed them already via the devices > insert guest additions CD image method in VBox. The Driver Manager versions are from the Ubuntu repo and are matched to the vbox version available in the repo. They may not work well or at all if they don't match the Vbox version running on the host. I'm running Version 5.2.18 of VirtualBox in Windows 10 host. So, if I understood correclty, since I'm running it in VirtualBox and already installed the guest additions, in this case there's no need to use Driver manager. I've chosen "do not use the device", restarted and re-installed the guest additions, just to be sure. Did not ran Driver Manager anymore. All seems to be working fine. I'm glad I've asked Thank you!